That's all you're gonna want to say about this recipe! YUMMMM. I can't even adequately describe this. It's just awesome, pretty much. And, like, it is a side dish that can be turned into an entree? 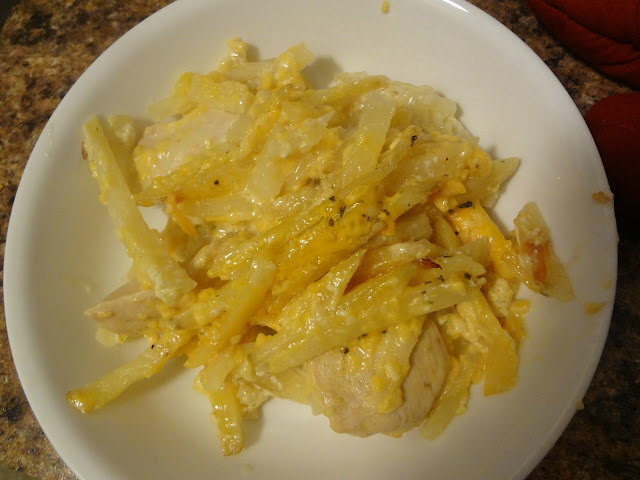 You could just have cheesy potatoes, or you could have chicken cheesy potatoes!? It's awesome. And, frankly, I'm lazy, so I totally vote for making this an all-in-one meal and just putting the chicken in there. However, if you have like a family thing or function or whatever you adult type peoples do, and are assigned to bring a side--this sans chicken is a total winner. Plus, if you're a vegetarian, maybe no chicken. Perhaps you could put something else up in there though? Eh? Maybe? I don't know-you guys are creative, I'm sure you'll figure something out. Note: BE CAREFUL! I totally made a mess, yesterday, making this. I used fat free evaporated milk in it for the first time and it bubbled over-completely blackening my casserole dish and getting gunk on the bottom of my oven. Have I mentioned I apparently am incapable of cleaning my oven? It's haaaard. I tried using baking soda and vinegar and that didn't work...ugh. I mean, it's clean....ish. lol. So yeah-learn from my mistake. Be careful. That said, the food itself was delicious. About 5 large potatoes--enough to fill a 9 x 13 dish. Optional: Chicken, browned in a skillet. 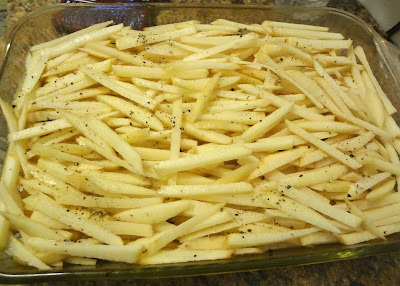 Cut potatoes into very thin, shoestring, french fry strips and lay in a greased 9 x 13 dish. Optional: Nestle pieces of browned chicken amongst the potatoes. Whisk together flour, Greek yogurt, and evaporated milk. Pour over potatoes. 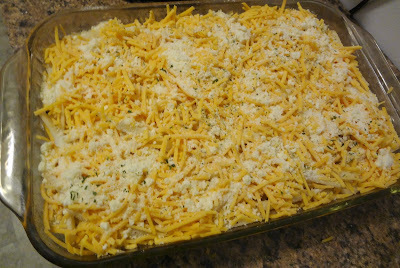 Sprinkle cheese on top. Then, sprinkle parsley to taste. Spray one side of foil with non-stick cooking spray and cover dish (greased side down, to prevent cheese from sticking). Pork a fork through foil a few times to allow steam to escape (and keep the cream from bubbling over). 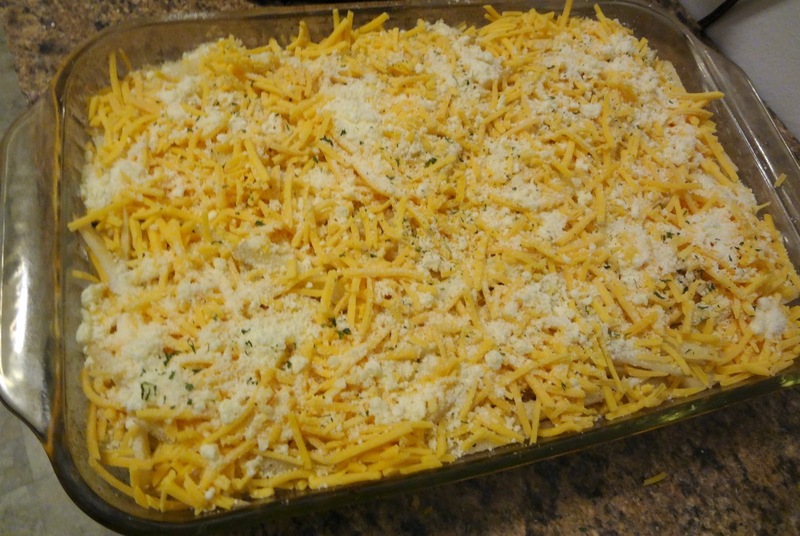 For safety, maybe place a baking sheet under the casserole dish--in case of bubbling over, to save your oven a bit of mess. Cook for 1 hour in the middle rack of the oven. Lower rack 1 rung and bake 15-20 more minutes. Allow to cool a bit, then dig in! Now I should stop saying goodness. Mmmmm cheesy and starchy? Yes please! 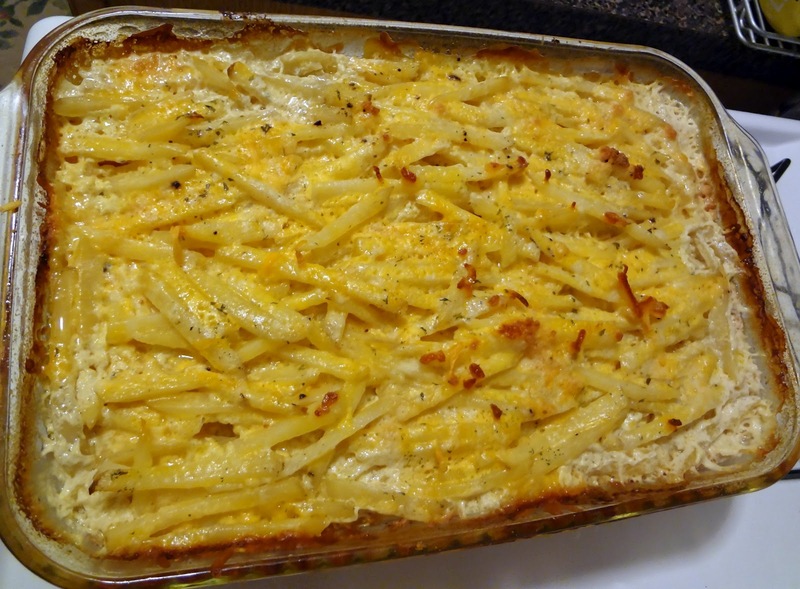 this looks like perfect comfort food! i am now totally craving this lol. 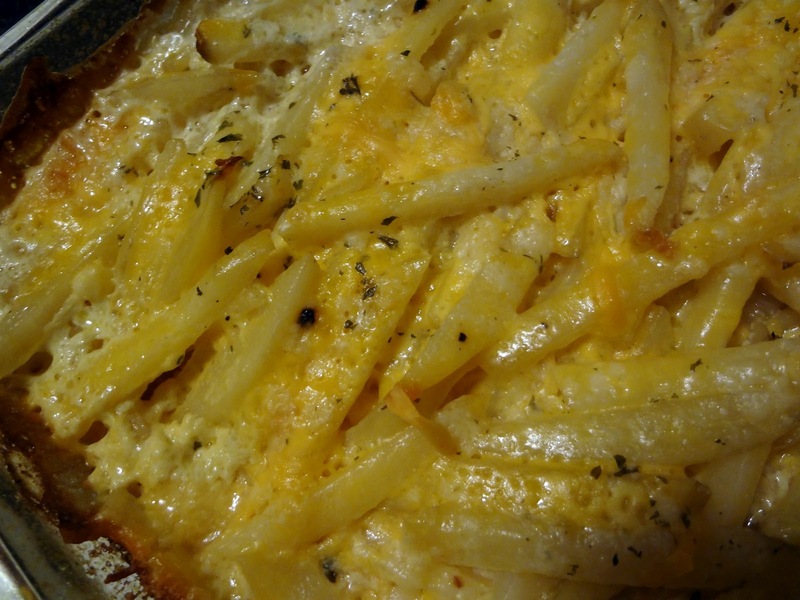 What is better than cheesy potatoes? Ughhh I LOVE cheesy potatoes!!! Hahah and I'm sorry about your oven!! That's such a pain. My oven constantly smells like frozen pizza bc I am wayyyy too lazy to get in there and clean :) We can both have totally disgusting ovens together when I move to NYC......!!!!!!!!!!!!!!! Ummm omg that does sound like an awful idea for pre-sport-playing, but so yummy for other times! My oven is a mess...I can't even begin to explain it. Somehow I think the baking soda made it worse. BUT I CANT WAIT TIL YOU MOVE HERE! Cheesy potatoes?! That's comfort food at its best! What a perfect treat for the weekend. Mmmmm, creamy potatoes.. Such comforting dish. Yum! The potatoes look amazing. I cannot wait for it to be a bit less humid to try them out...I think my husband will fall over with happiness. I hate cleaning the oven too. It is so hard to bend over and reach in, it is just not natural to have your head in the oven.